Another trailer transport job this week. A local move from Marjal to another site nearby. A couple wanted to change sites and as always with American travel trailers and 5th wheel caravans, they are not easy to move. They require specialised vehicles fitted with specialised equipment. Fortunately, Monster Moovers were on hand. As usual, Spanish campsites (or most campsites, for that matter) have small pitches, where 5th wheels and travel trailers are concerned and often, space can be very limited to manoeuvre large caravans. Travel trailers, like the one moved here, are more awkward to move than 5th wheels, purely due to the length. 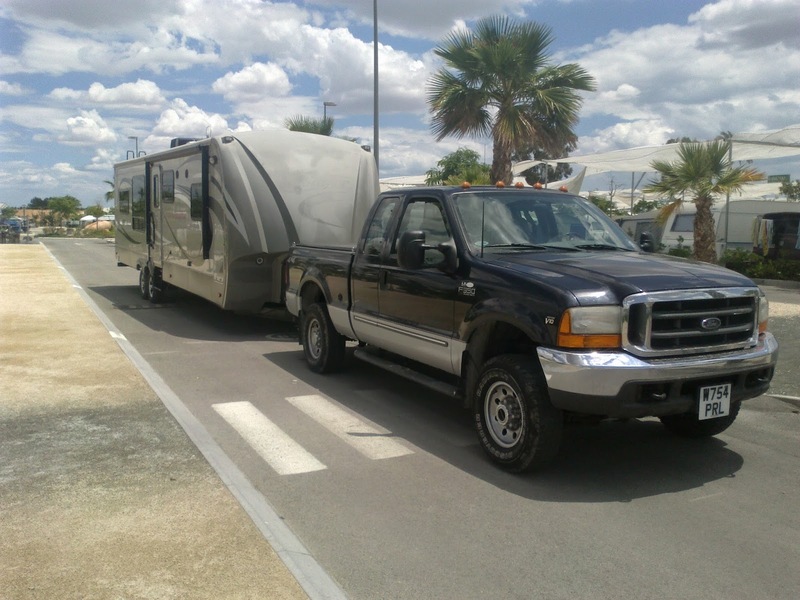 A 35' travel trailer, can be as long as 38' including the drawbar, behind the tow vehicle, whereas a 35' fifth wheel will be around 5 or 6 feet shorter due to the fact that a portion of the trailer is over the back of the truck, therefore a 5th wheel of the same size is easier to manoeuvre.